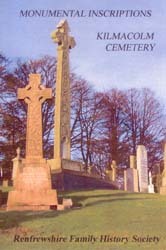 As part of a massive project to record all of the headstones in Inverclyde Cemeteries, volunteers from our society have successfully completed transcribing & photographing the headstones at Kilmacolm Cemetery. Each stone has been photographed and copies can obtained from the Society at a charge. The details of the stones, condition, type of stone, used lettering and inscription can also be obtained for a nominal fee.